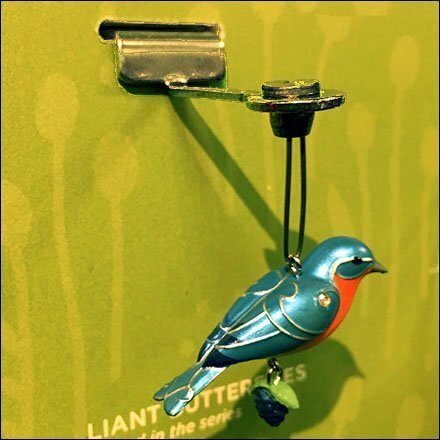 More than Christmas Decoration, this colorful Hallmark Eastern Bluebird Ornament Display Hook is but one of four in a mini offering of Hallmark Keepsake items. In the off-season (ie, non-Christmas) freestanding hanger (not shown) can display your collection, be it the first Easter Bluebird of Spring, or garden Faries and Butterflies. Of course, the FixturesCloseUp interest was the merchandising Display Hook, a specialty variety used by Hallmark year round. This Ornament seen at a Hallmark Gold Crown Store.